Let's be honest: With less than a month to go before Vermont's August 9 primary, the race for the Democratic gubernatorial nomination remains a total snoozer. The three major Ds vying to replace retiring Gov. Peter Shumlin have done little to distinguish themselves from one another, on substance or style. And unlike the last competitive contest — when Shumlin wrested the nomination from four other political heavyweights back in 2010 — the electorate doesn't appear all that interested. "I think most people don't realize we have an August primary, and I think people are very focused on what's happening nationally, for good reason," says one of the contenders, former transportation secretary Sue Minter. Indeed. After another week of bloodshed and turmoil — from Baton Rouge to St. Paul to Dallas — it's hard to get worked up about school district consolidation in our little corner of the country. And as fellow candidate Matt Dunne notes, many voters have been focused on "a presidential contest that happened to involve a certain Vermonter." "For perfectly good reason, it just happens to mean the center of attention just hasn't been on the governor's race," the former Google manager and state senator adds. The third contender, former ambassador and state senator Peter Galbraith, says the unusually long campaign season, which began 13 months ago when Shumlin announced his retirement, has "dissipated" interest in it. And he criticizes the state's decision to move its primary to the doldrums of August. "If you asked me to pick the worst day possible to hold an election, I probably would pick that date," he says. Not that Vermont primaries have, historically, turned out an abundance of voters. In 2010, just 74,596 of the state's 444,341 registered voters cast Democratic ballots. Because there were so many candidates that year, Shumlin managed to win the nomination with support from just 18,276 people — fewer than live in the town of Essex. And that was the most competitive Democratic gubernatorial primary since Jerry Diamond bested Timothy O'Connor back in 1980. This time around, some observers think just 60,000 Ds will turn out, meaning the victor might need no more than 25,000 votes. All three candidates are working hard to win those votes, but they face a far less motivated electorate than in 2010. Back then, Democrats were itching to take back the governor's office after eight years of frustration under Republican governor Jim Douglas. "I think that really did animate the race," says Democratic strategist Bill Lofy, who served as Shumlin's first chief of staff. "In this race, there isn't that obvious a level of energy around it because we have a Democrat in the governor's office." Former lieutenant governor Doug Racine experienced much the same when he attempted to succeed fellow Democrat Howard Dean in the 2002 gubernatorial election. "There was Dean fatigue then. And I think there's Shumlin fatigue now," says Racine, who ran again in 2010 and later served in the Shumlin administration. "I don't know if it's coincidence, but every time there's an open seat, the governorship goes back to the other party." 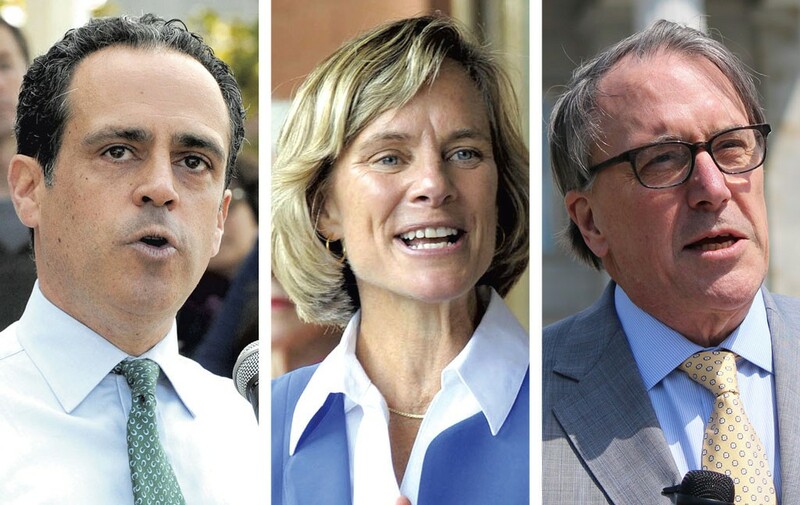 Recognizing Shumlin's unpopularity, the Democratic candidates have all sought to distance themselves from the incumbent. But they often sound like they're channeling him — or refighting his old battles. Galbraith can barely get through an interview without mentioning that he drafted a financing plan for Shumlin's single-payer health care plan before the governor abandoned it. At a recent press conference in Montpelier, Dunne sounded as cocky and unconvincing as Shumlin in his assurances that he could fix Vermont Health Connect — simply by bringing in the right people. And as the incumbent did when he ran for reelection in 2012, Minter has run television ad after television ad promoting her work responding to Tropical Storm Irene. They're not channeling just Shumlin. When Minter released her higher education plan last month, she gave it the unfortunate name of "Vermont Promise" — the same thing Douglas called his doomed college scholarship plan a decade ago. Minter and Dunne are especially prone to the political cliché, decrying, respectively, "one-size-fits-all" and "cookie-cutter" approaches to education reform. Silos, if you ask Minter, seem to be in desperate need of breaking down. Lofy, who remains neutral in the race, warns that recycling that kind of pabulum isn't going to work in 2016, when voters are "anxious, angry and uncertain." "My sense is that those candidates who pursue that more traditional, cautious, boilerplate path are pursuing a losing political strategy in this political climate," he says. The three Democrats seem to sense that. To an almost farcical degree, they've been mimicking and name-dropping Sen. Bernie Sanders (I-Vt.) and appropriating elements of his presidential platform and rhetoric. Ellis Mills Public Affairs lobbyist Kevin Ellis says he understands the impulse to emulate Sanders, but he wonders whether voters will really buy it. Whether any of the three are finding traction is difficult to say. It's been five months since the latest nonpartisan poll and four months since the candidates have had to disclose their campaign finances. Anecdotally, Dunne and Minter appear to have picked up more establishment support, and they are running more robust operations: Both have 10 paid staffers apiece, while Galbraith has just three. But the former ambassador seems to be having a greater impact on the debate. Since he declared his candidacy in March with a focus on economic populism, he has pulled his peers a smidge to the left. Now all three say they hope to raise the minimum wage to $15 an hour, though Minter won't commit to a specific time frame. As they make their final pitches, Galbraith's foes aren't focusing on policy distinctions. Asked how she differs from her opponents, Minter notes that she has spent her career in Vermont — not "outside the state." Dunne's time at Google has taken him across the country, while Galbraith's diplomatic work has taken him across the globe. "I've been here in Vermont, delivering for Vermonters," Minter says without a trace of subtlety. "And I think when you ask who's done more for Vermonters, I think the choice is pretty obvious." Dunne, meanwhile, frames it as a political choice. "Who can beat Phil Scott?" he asks, referring to the Republican lieutenant governor, who is seen as the front-runner for his party's nomination. "If candidates have similar views, who can actually win in November?" It's a good question. But the answer right now, if the Democrats don't get energized, might be none of them. So, um, have statewide Republican candidates Bruce Lisman and Scott Milne determined yet whether they'll support their party's racist, sexist, xenophobic presidential nominee? Lisman, who is challenging Scott for the GOP gubernatorial nomination, "continues to evaluate" birther Donald Trump's candidacy, according to campaign manager Shawn Shouldice. "Bruce will continue to give the issue deliberate and thorough consideration," she says. Phew! If Lisman's months-long dodge isn't "deliberate and thorough," I don't know what is. Milne, who's running against Sen. Patrick Leahy (D-Vt.), says he's still "listening" to Vermonters and weighing his options. Of which there are basically two. "There's a lot of time between now and November 8," he says. "I know Seven Days wants me to make a decision every Monday, but I don't think anyone else does." Then his indecision shouldn't be a problem. Anyway, Milne notes, "It's not a guaranteed sure thing that Trump is gonna be the nominee, so let's get through that." After 42 years in the journalism business, Valley News editor-at-large Jim Fox has called it quits. Fox spent much of his career at the helm of the bistate daily, which is headquartered in West Lebanon, N.H. He handed off day-to-day management of the newsroom a decade ago and has been mentoring reporters and writing editorials ever since. "I don't think it's an exaggeration to say that Jim Fox has been the heart and soul of the Valley News for more than 20 years," says editor Marty Frank. Fox, 66, says he came to the conclusion that "enough was enough." "I will contribute a couple of editorials a week to the [paper], watch a lot of baseball, commune deeply with my bullmastiff and read a lot of books," he says. "As to what else, I'm not sure yet." Farther south, the publisher of the Brattleboro Reformer, Bennington Banner, Manchester Journal and Berkshire Eagle has also departed — though it's unclear precisely why. Edward Woods had worked for the papers' parent company, New England Newspapers, for 11 years and also held the title of CEO. In a press release issued last week, one of the group's new owners, Hans Morris, called it "a friendly separation." Speaking to Seven Days, Woods declined to elaborate, citing a nondisclosure agreement, but he called the move "100 percent" voluntary. Replacing him, at least on a temporary basis, is an old hand. Martin Langeveld worked for the papers from 1978 until 2008, serving at times as publisher of the Reformer and the North Adams Transcript. He advised the new, local ownership group when it bought the papers in May from Digital First Media, and he plans to stick around until "we hire the very best person we can for this." Langeveld says he's focusing on "rebuilding the newsroom" after years of cuts — and bringing back jobs that had been outsourced to other Digital First locations. "We definitely have already grown the staff significantly," he says. Re: The Statehouse Foretold: What Bills Will the Vermont Legislature Pass?